A new evolution Wave Piercing Catamaran, “SHER KHAN “ has the outward appearance of a strong, robust expedition motor yacht designed to cross oceans. However...........once inside you are cocooned in luxury, all the pleasures and comforts of home have been included. Guest cabins are roomy , featuring queen sized island beds , full sized showers and individual wardrobes. Colours are light and airy, with large windows being an important feature of each room. 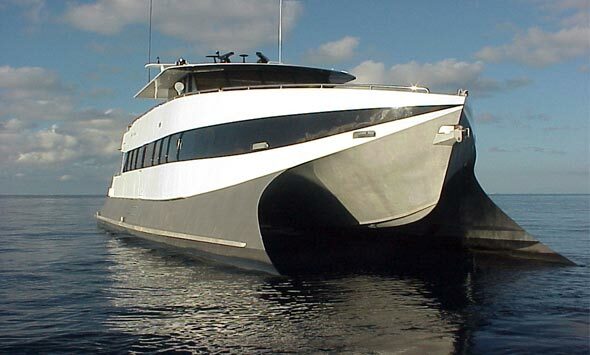 With her fourth queen size cabin located behind the wheelhouse, “Sher Khan “ can either be owner operated or run easily by a couple. Living and entertainment areas are spacious and open in plan, BBQ on the covered aft deck with comfortable seating for ten or dine inside in air conditioned comfort. The protected foredeck forms a private sheltered area with cushioned sun lounges. Separate fishing and diving storage rooms , built into each transom lead to direct water access. The custom built 4.7 metre aluminium tender was designed for game fishing and diving. A hydraulically driven elevator raises and lowers this tender without fuss. Systems and engineering onboard are practical and reliable, 25 years experience of handling and maintaining motor yachts world wide has culminated in this vessel. Dependable Gardner engines were selected for their reliability and fuel economy. “Sher Khan” has a massive fuel range of 10,000 nautical miles and at her comfortable 10 knot cruising speed will only use 32 litres of diesel per hour . Full keels provide rudder and propeller protection and allow for beaching of the vessel. The keel cooling system built into her alloy hull extends pump life as well as maintaining her efficient hydrodynamics. "Sher Khan” was designed to be as low maintenance as possible. For those seeking adventure, "Sher Khan" will carry you to the remote areas of the world in comfort and safety.